SWMBO told me that the house was going on sale. That sentence translated into – we’re buying it. The house had belonged to her aunt and uncle, and it didn’t matter whether it was something worth buying. After walking through it (it took about 30 seconds), and from what I saw, it looked doable. That’s it! About 670 sq ft, slab on grade. Oh, it does have a garage – almost as big as the house. The plan is to turn it into a rental. City ordinance regarding rentals is almost as thick as a phone book. The landlord has to bring everything up to code (the city code goes beyond IRC 2009). I also have to have inspections from 3rd party on the furnace. Additionally, I will have to pay $198 for a 3-year license allowing me to rent the property. Once I started demo, it hit me – this is not a quick fix. But, that’s for the next one. You sure have your work cut out for you. I hope you got one hell of a deal and the outside doesn’t need as much as the inside. Looks like a lot to do but I’m sure it will be nice when you’re done. We are also buying a 2 bedroom ranch rental across the street but it’s completely refinished already including a new furnace and HW heater. The roof needs to be replaced and the garage could use new siding. 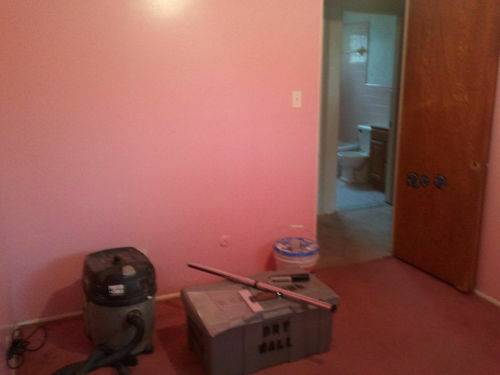 It has a full base ment with no leaks and new pergo flooring through out. I should be able to rent it for 1250.00 mo. At 56 yrs. old, I just don’t have the energy or desire to do that much work on another house other than mine so this one is perfect. I’m nervous about dealing with a renter so my wife and I are joining an investor’s club that meets once a month and shares info about how to buy, where and how to screen good renters. That’s the key – getting a good renter. The 198.00 permit fee – what a crock! You know that’s going to go up every year. We don’t have that fee here in illinois yet but I’m sure it’s coming. Mark – thanks for your words of encouragement. 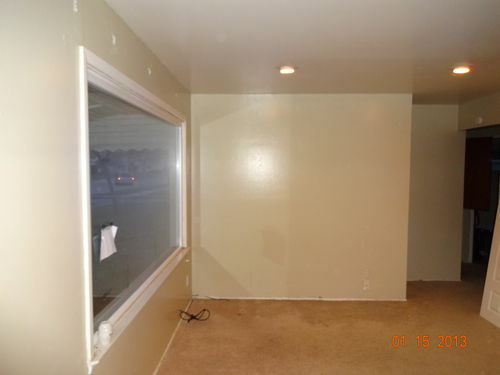 The house ran $19k out the door. It has a rather larger yard, something that will draw animal loving people (other then the pit bull that lives behind the house). Wait until you see the pictures of my work. 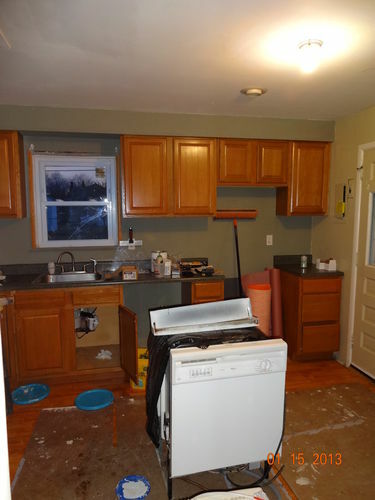 Oh yes, this is a REAL fixer-upper. We’re looking at around $600 – $700/month. It’s in the original part of the city, so the houses are not as good as other sections. Still, they are solid for the most part. From what I see, many of the houses in the area are renting for $800-$900/month. Fortunately, I know enough people who would like to rent the house, so I’m already familiar with who they are and trust them to take care of it. 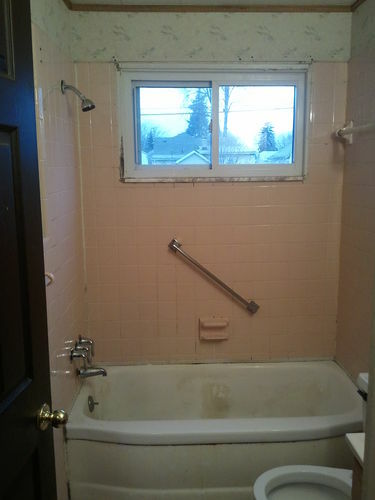 All-in-all, I’m looking to dump less then $5k total into the house (minus my labor). The subs are friends of mine, and they are cutting me deals (I need a total electrical re-wire, and a total re-plumbing). The flooring is free from another friend works for a tile company and is able to get lots that would be thrown away (30 sq ft or so). 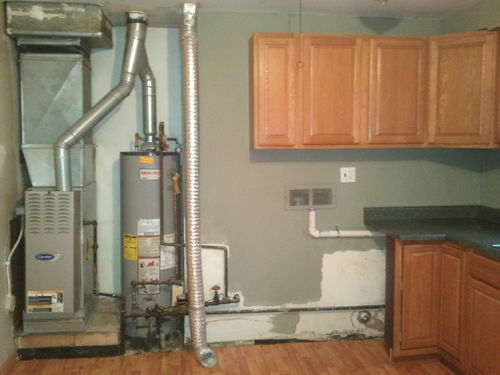 We bought the appliances at a great price and the furnace is rather new. Heck, I might even be able to keep it under $3k (but I’m sure there will be other issues the city will find, so I’m high-balling it). The city loves to charge for everything. I used to live there, but got tired of them stealing my paycheck from me. Guess that is what happens when people rule you. 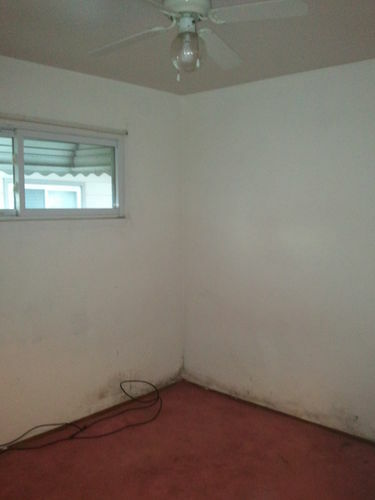 Just remember it’s an investment property. 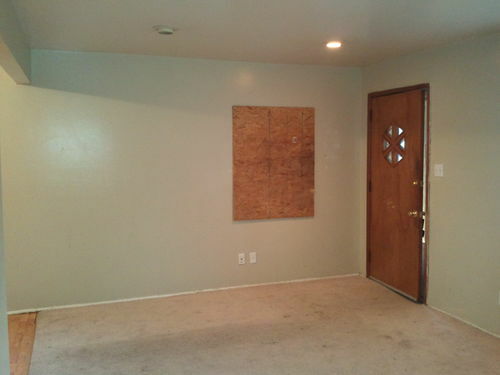 Use the KISS standard of home improvements. I guess that’s only if the BS…I mean building dept…. doesn’t bury you. Hopefully there is a common sense inspector in your area. It seems like you have enough friends to help keep it affordable. Maybe I can come down for a day and give you a hand with something if you need it. Man, for that price how can you go wrong? Good investment! Will you be able to enclose the furnace and WH? couple of ideas: You could install a 3/4 oak ply stained partition “fridge wall” with a 1×2 stile on the right side of the WH, a louvered bi fold or hinged door with a oak panel above, add another matching upper cabinet to fill in above the dryer. That would look good…. Probably easier said than done. My neighbor had a solid picture window like that and she wanted to add sash windows that open. There wasn’t wall space for a new opening so we rebuilt the opening bigger and made a floating (8” above the ground) bay window with the old window and two small casements. The 24” tall bay bench top had 3/4” oak flooring with a 1” stair nosing and we made hidden panels below for storage. It was amazing how much it opened up the room too. 16 more sq. feet for free. Cat sure loved it. Ha! Sounds like you’ve got a great network, that’s what it’s all about. Wow Billy, that’s a steal – I think. I’ll be right there with my sleeves rolled up and ready to give a hand. Well – I certainly wish I could. If i had my way, I could help out for a month and take it all in while we make it happen. That would be a great joy to me. You say 5 grand is enough for materials and subs? Amazing. I hope that number works well. Tanks guys. Gary – unfortunately, I’ve already made this a job. I’ll post the latest developments tonight. Actually, the inspectors are easy to deal with, it’s the bureaucracy that drives people to not pull permits. I haven’t checked lately, but they used to require a $15 permit for a homeowner to change a $0.59 electrical switch. 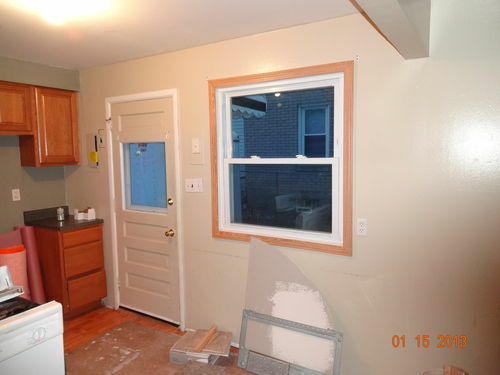 Mark (Illinois) – there was originally a wall that separated the kitchen from the “utility” room. My wife wanted me to put up a quarter wall – just enough to cover the furnace and WH. However, I decided to make more work for myself. You’ll see. Mark (Texas) – it would be great having you and Gary come help. Oh, something else. I just brewed some porter and could use some help drinking it. I’ll be brewing some more – I’ll make sure I have some left by July (coming to Texas again). If it were not for having some friends in the right trades, I could see this getting out of hand. Billy – No need to ply me with Porter – BUT – I really appreciate that kind of plying. Mi casa es su casa. I’ve got some space for you and the family in July. Think about it. My family already loves you guys because of all the help you have been. So…are you knee deep in the fun yet? Yep. Just posted the next segment. Having lots of fun. Wish I could post everything that I see – it’s one of those “fix-er-uppers” that probably should have been left alone. But hey, it keeps me out of trouble!! !